Columbia Basin Racquet Club’s Adult Tennis Program is designed for all adults who enjoy tennis. There are classes for many different ages and purposes including Adults 50+, Cardio Tennis, Beginners, Boot Camp, and more. All classes are offered as full sessions or on a drop-in basis. Register for full sessions and save money! 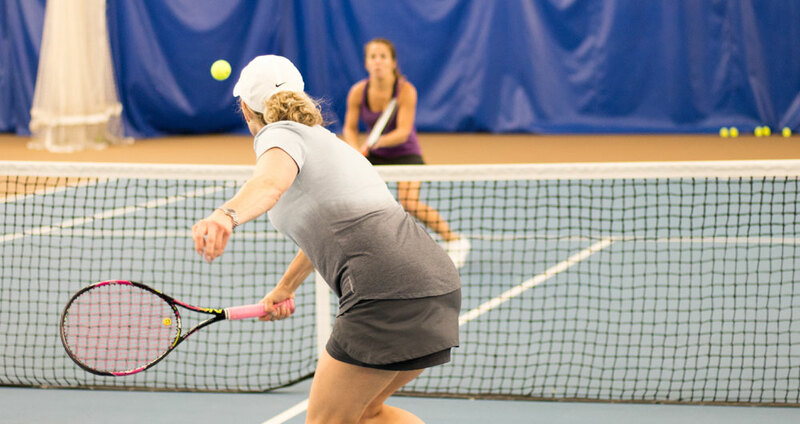 We also offer Women’s League for all levels on Monday evenings and 2 sessions on Thursday mornings, Men’s Night on Wednesday evening, Mixed Doubles play (ask for details), social events, USTA teams, tournaments, and much more. Download the flyer and return it to the front desk, or you can register and pay online. Save money by registering for full sessions! Adults just getting started in tennis are invited to join this class! Players will learn basic technique, grips, court positioning, singles and doubles concepts, and general rules of the game. In this class we will work on basic strategies. Where to stand, why to stand there, and what to anticipate. Classes will also include technique work. This is a 3.5+ level class that keeps you moving through purposeful drills and shot making points. Lot’s of live ball drills that put an emphasis on live point play. Boot Camp is a longer class (90 minutes) designed to work on quick feet, agility, and balance. Drills and games are competitive with a major emphasis on learning. Cardio Tennis is a fun group activity designed to supplement and enhance your current fitness workout. Classes are designed for all levels and include a warm-up, cardio workout, and cool down. and still working on executing shots. Emphasis is on directional control, depth, and power control. Patterns of play will be explored and focus will be on developing specialty shots. 50 & Fit is designed to keep those adults 50 and older moving on the tennis court!